Soak up the festive energy that infuses Philadelphia’s city streets, shopping districts and parks during the holiday season. You’ll revel in the celebratory atmosphere on this 3-hour walking tour of downtown, aka Center City. Listen to a performance by one of the largest organs in the world, explore vibrant Reading Terminal Market and Rittenhouse Square, see a holiday show via a skyscraper’s LED-screen, and enjoy free time at Love Park’s annual outdoor Christmas village. Numbers are limited to 12 for a small-group experience with an informative guide. 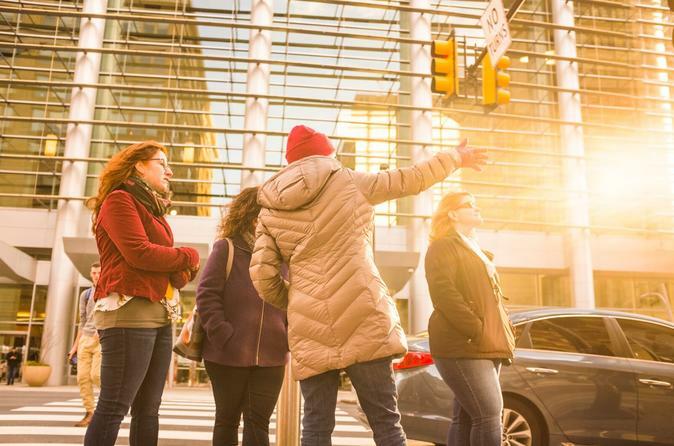 Meet your guide at City Hall, the cultural and geographic heart of central Philadelphia, and begin your holiday walking tour of downtown, also known as Center City. At nearby Dilworth Park, watch ice skaters glide against the backdrop of City Hall before continuing on to the Reading Terminal, a US National Historic Landmark. Downstairs, explore the dynamic Reading Terminal Market, where you can grab a bite to eat (own expense) and smell the aromas of cuisines from around the world. Here, admire an impressive model train set displayed for the holiday season. Head east to the Wanamaker Building, which hosts a seasonal light and sound show featuring one of the world's largest pipe organs. After the concert, follow your guide to one of Philly's biggest shopping and restaurant districts. Snap photos of the eye-catching window displays as you stroll the neighborhood buzzing with holiday shoppers. Your Philadelphia city tour continues to Rittenhouse Square to see the towering Christmas tree and view the church where a favorite Christmas carol was written and first performed. Then, you’re treated to a holiday show spectacular from the massive LED TV screen inside the Comcast Center. From here, walk toward Ben Franklin Parkway with views of Logan Square, Sister Cities Park, and the Cathedral Basilica of Saints Peter and Paul—a Christmas destination for many Catholics in the Philadelphia area. Your tour concludes at Love Park, where you can experience one of Philly's fastest-growing traditions. Visit a traditional outdoor Christmas village, and enjoy the winter wonderland as you bask in the holiday spirit. You may be tempted by the numerous street food vendors, or continue shopping and exploring the city on your own.